After the EU and the US, Japan is the UK’s largest fashion clothing and textile export market. According to recent survey, EU Japan free trade agreement is being discussed at the moment. If these negotiations concluded, this could add £5 billion a year to UK GDP. Many UK designers and textile manufacturers consider Japan is actually their most important fashion clothing market. How to break into the fashion industry in Japan? It is important that UK designers understand how to approach this Japanese fashion clothing market. And to understand what are the market demands. Another important factor is that UK designers must understand the very special culture in the Japanese fashion clothing market. We learn that the womenswear fashion and accessories line in Japan are quite ultra-feminine designs due to its cultural background. Here at Perfect Labels Lanyards, we specialize in custom designer fashion clothing labels manufacturing for so many years. We have created so many woven labels for designer fashion clothing, and their fashion clothing businesses are doing so well with our custom woven labels. Please contact us on below number or send us your artwork, we will help to produce the bespoke designer fashion clothing label for your new clothing products in Japanese fashion industry. 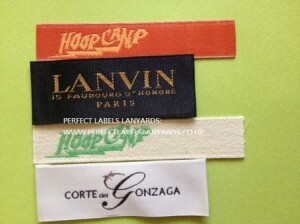 Are you a Designer looking for that professionally finished woven labels to your Designer Garments? 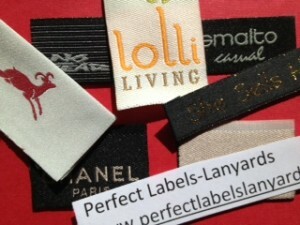 Then look no further than Perfect Labels Lanyards for your Woven Designer Labels. Our Woven Designer Labels can be customised to suit your design specifications from size, colour, shape, images and text to perfectly compliment your brand image and the garments themselves. 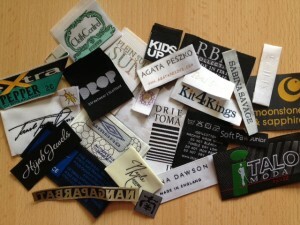 Looking for the designer woven labels for your clothing products? Perfect Labels Lanyards have been creating designer woven labels for clothing for many years; it is our specialty and we share this specialty with our valuable customers. We are able to customise woven labels for clothing to any specification from colour, width, length, design and text creating a truly bespoke woven label. So contact us today for our woven labels for clothing and help set your business or clothing company apart from your competitors. We are set up and ready to deliver perfect Woven Labels for Clothing.